This schloss has been a noble residence ever since the 16th century when it was the home of the knight Hieronymus von Stauber, a finance expert. In 1700 the last of the Staubers, Regina Immhof, married Ferdinand von Hirschberg who expanded the castle into a palatial hunting lodge. This family died out a hundred years later. 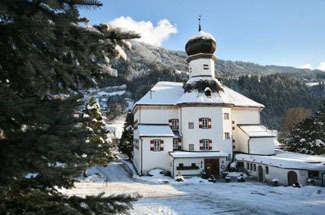 In 1873, Josef Mayr purchased the property, and his descendents opened the schloss as a country inn in 1938. Presently, the fifth generation of the family oversee the hotel. Austria has a number of stunning bicycle trails. The schloss lies along the Inntalradweg or Inn Valley Bicycle Trail, which begins in the Swiss Alps, passes through Innsbruck, and continues on to Passau, Germany. The hotel heartily welcomes bicyclists to stay. There’s a place to leave your bicycle at night, and a small bicycle repair service is also available. Open: February through the first week of January. The castle is located about 30 km northeast of Innsbruck. From the A12, exit at Schwaz and merge onto Anschlussstelle Schwaz. Continue onto Munchner Strasse. At the roundabout, take the first exit onto Tiroler Strasse (B171). Right on Swarovskistrasse. First left onto Doktor-Theodor-Körner-Strasse, which turns right and becomes Innhöfe. The castle is along the Inn River. Vomp has a train station. Located next to some fragrant meadows and orchards, this small, rustic castle hotel invites you to idle away the afternoon in a sunny patio or a garden next to the Inn River. The atmosphere here is more of a traditional, family-run inn over a more formal hotel. Although not luxurious, the clean and tidy, and individually decorated guest rooms are quite comfortable. A few of the apartments, which have sitting rooms, can hold up to four people. Satellite TVs are in every room. Bathrooms come equipped with showers. Free Internet is available at the hotel. The hotel restaurant offers well-prepared, home-cooked Tyrolean specialties. If the weather is fine, the town of Schwaz is just a ten-minute walk away.